The Tampa Bay Buccaneers visit the Buffalo Bills in Week 7 of the 2017 NFL season. PFF previews the top player matchups of the game. 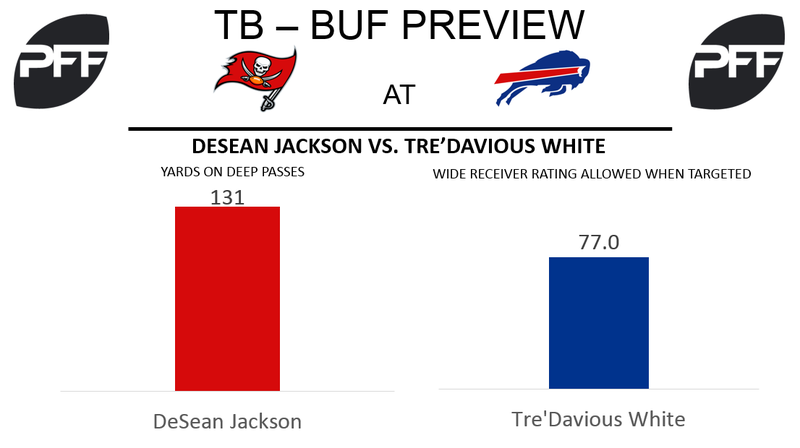 WR DeSean Jackson vs. CB Tre’Davious White – This Sunday’s matchup between the Buccaneers and the Bills will feature a marquee matchup between Buccaneers’ wide receiver Mike Evans and Bills’ cornerback E.J. Gaines. Given the two evenly matched opponents, the Buccaneers will likely need another offensive difference maker to step up. Wide receiver DeSean Jackson is a prime candidate to fulfill the need for a second option next to Evans and Jackson has lived up to his reputation as one of the league’s best deep threats this season. Now in his 10th season in the NFL, Jackson currently ranks 11th among wide receivers in yards on deep passes (passes of 20 or more yards downfield) with 131 yards on such passes. Bills’ cornerback Tre’Davious White will be tasked with trying to slow down Jackson and his deep passing prowess. So far in his rookie season, White has done a respectable job in coverage by yielding a passer rating of 77.0 to opposing wide receivers, which ranks 40th out of 110 qualified cornerbacks. RB Doug Martin vs. LB Preston Brown – Buccaneers running back Doug Martin has provided a spark in the Buccaneers rushing game in his return to the lineup back in Week 5. Over the past two games, Martin has earned a team-high rushing grade of 64.0, which he will have a chance to improve on this weekend. The Bills will rely on linebacker Preston Brown to shut down the Buccaneers rushing attack. Brown has been one of the better tacklers this season, as he has a tackling efficiency of 36.0, which ranks sixth among inside linebackers (minimum 80 snaps). T Donovan Smith vs. Edge Jerry Hughes – Over the past few seasons, Bills’ edge defender has been one of the more consistent defensive players in the NFL. This season is no different as he is earning the highest grade of his career so far with an overall grade of 89.1, which ranks fifth out of 104 qualified edge defenders. Hughes rushes almost exclusively from the defensive right side, which means he will be matched up mostly against Buccaneers’ left tackle Donovan Smith in pass-rushing situations. Smith’s strong suit is pass blocking, as he has earned the 30th best pass-blocking efficiency rating (out of 60 qualified tackles) with a rating of 94.6. 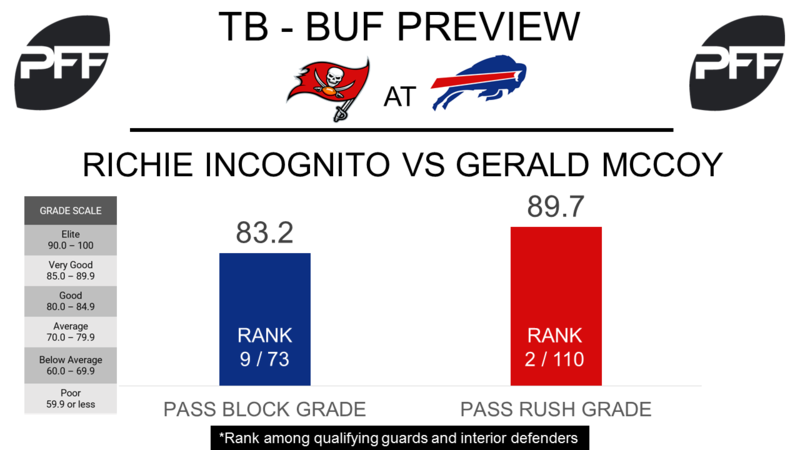 G Richie Incognito vs. DI Gerald McCoy – This will be the key battle in the trenches on Sunday, particularly on passing downs. Incognito has the ninth best pass-block grade among guards this season with a grade of 83.2. Additionally Incognito has only surrendered four total pressures on his 171 pass-block snaps, his pass-blocking efficiency (PBE) of 98.1 ranks ninth (PBE measures pressure allowed on a per snap basis with weighting towards sacks). McCoy is grading at an elite level this season, his overall PFF grade of 91.1 ranks third among interior defenders and his pass-rush grade of 89.7 is the second highest by an interior defender. His 22 total pressures are the fifth most this season and are the third most between the weeks of 2-6. RB LeSean McCoy vs. LB Kendell Beckwith – McCoy has so far struggled this season, his elusive rating of 29.6 ranks 32nd among 48 running backs, and he has only forced 18 missed tackles on his 114 touches, although his 8 missed tackles forced as a receiver are tied for the third most. Beckwith has really impressed so far in his rookie season, his overall PFF grade of 77.2 ranks 27th among linebackers and is second among rookies. Beckwith has 13 stops in run defense, which is tied for eighth and his run-stop percentage of 10.0 ranks 19th (a run stop is a tackle made in run defense that results in a “WIN” for the defense). QB Tyrod Taylor vs. CB Vernon Hargreaves – Taylor has been great this season, he is PFF’s sixth highest graded quarterback with an overall grade of 83.4, but he could be without his two best weapons on Sunday in Jordan Matthews and Charles Clay. Without his two favorite targets, Taylor would be best to target Vernon Hargreaves who has been one of the worst corners in 2017. Hargreaves ranks 110th out of 114 cornerbacks with an overall PFF grade of 38.4, his passer rating allowed when targeted of 128.7 is the fifth worst this season.